Claim a rewarding respite amid a serene, tree-lined enclave – and the best thing about it is that you don’t have to go all the way to the countryside to find it. Believe it or not, there’s one right in the heart of the metropolis. 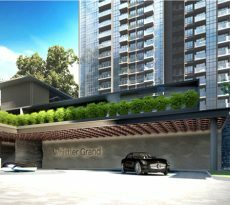 Goodwood Grand is an private community on 16 Balmoral Road in District 10, within the vicinity of Orchard, Holland and Thomson. The exclusive freehold address is a perfect haven to come home to after a busy work day, combining the comforts of city living and the pleasantness of the countryside..
Over 57,000 square feet of property are being prepared to contain a condominium tower as well as 8 strata houses, making way for 73 brand-new homes. Everything will be enveloped in graceful landscaping, and punctuated by exciting amenities. It will all be ready by the end of 2018, and fully completed by December 2021. 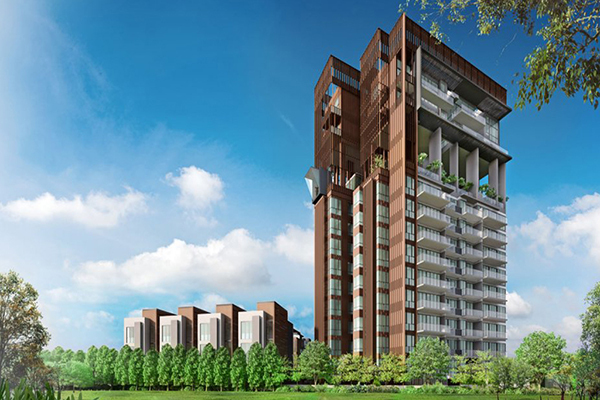 The 12-storey tower will be a stunning work of art featuring sleek, sturdy planes made to look airy by glass paneling. The appearance will be further softened by the delicate, vertical lines of the wood detail. This tower will be the showcase for a variety of elegant apartment units, 65 in all. Residents living in the tower will have the privilege of using the basement parking area, which has 70 spaces, including 3 for visitors and 2 with handicap access. Goodwood Grand will surely make life much more alluring with its spread of amenities. Upon entering the compound and passing the guard house, you’ll be welcomed by a courtyard. Beside it will be the Green Trellis, which will open into to the Grand Walkway. This in turn will lead to the Play Lawn, and the the Tranquil Garden at the foot of the condo tower. At one side, you’ll find the pool area, composed of an infinity lap pool, a children’s pool, and a sun deck. On the other side shall be the Verdant Garden Walk, bringing you around the tower, and toward the reflective ponds. On top of all these, the condo tower will present even more pleasures for you to delight in. The tenth storey is to have a garden of niceties overlooking the city panorama. There, you’ll find the Grand Clubhouse; next to it, the barbecue patio, an al fresco dining area, and a water feature. On the opposite side will be the Children’s Play Zone, the Meditation Corner, an indoor gym, and an observation deck. There will also be some stepping laws and landscaped greenery. For your convenience, the tenth storey will be equipped with a toilet with handicap access. The nearest MRT station to Goodwood Grand is the Newton Station, which is just a little over half a kilometer away. In a little while, the new Stevens MRT Station will also be servicing the area too. Those who prefer driving can take Bukit Timah Road, the CTE, or the Pan-Island Expressway. 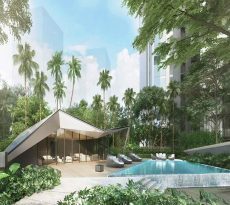 One of the most well-known destinations in the area is the illustrious Orchard Road, domain of many first-rate shopping malls, hotels, restaurants, and a host of amenities. And just a few blocks from home are Tanglin Club, the American Club, and Newton Food Center. Also quite near by are United Square Shopping Mall, Singapore Botanic Gardens, and the Novena Medical Hub. Schools are left and right in this part of the city, which is just great for families with children. Some of which are Raffles Girls’ Secondary, Anglo Chinese School (Primary and Secondary campuses), Chinese International School, Singapore Chinese Girls’ School, and Chatsworth International School. 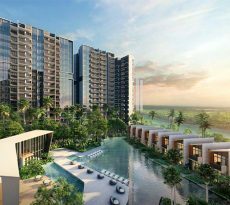 Goodwood Grand is a project of the Tong Eng Group – the conglomeration of Tong Eng Brothers, Tiong Seng Holdings and Clarus Corporation. The group has a 50-year track record of quality real estate, including residential, corporate, and commercial properties. How would you like to settle down in a home set in the middle of a garden, in the middle of the city? Contact iCompareLoan mortgage broker today to compare home loan Singapore.